→Electrolysis – Your Questions Answered! Here is a list of all the questions that you've sent us with answers provided by our electrolysis expert, Alana Dzurek. Question - Is there a danger with having multiple electrolysis sessions without days in between appointments treating the same area & not telling them that I had treatment the day before? Yes, there is a potential danger in receiving multiple Electrolysis treatments in the same area without a few days to properly heal the area. Results vary, poor/slow healing, and complications due to tissue swelling, redness and soreness are all part of repeating treatment without enough time for skin to heal. The more you overwork an area, the longer it takes to recover the skin. I have a tan. Can that affect skin pigment when applying electrolysis? Is it better to wait until fall or winter so sun exposure is limited? It is absolutely recommended that you use caution when tanning while receiving Electrolysis treatment. There can be hypo-pigmentation issues as a result of Electrolysis treatment and sun exposure. Use sunblock and do NOT tan for at least 24 hours. To avoid any kind of possible pigmentation, wait to receive treatment when you’re not tanning. ​I have wrinkles on my upper lip - will electrolysis cause more wrinkles? Electrolysis does NOT cause wrinkles, in fact when properly administered, there should be NO damage to the skin at all. 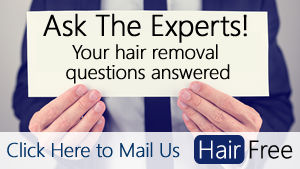 At Beverly Hills Hair Free, once the hair is removed, the skin actually begins to improve in appearance. Can it affect any mild heart or blood pressure issues? Electrolysis does not have a direct effect on blood pressure or heart issues, however, if you have heart, blood pressure issues or diabetes, please disclose your issue to your electrologist. As all of these health issues slow down your ability to heal properly (especially diabetics) and may impede healing in some cases. My electrologist uses oil based natural products. Can these oils cause problems in the open hair follicle when used in conjunction with the electrolysis? In my professional opinion, applying oil-based product after treatment is fine as long as the product has healing properties. I do NOT however recommend applying oil-based products to acne prone skin, the oil only exacerbated the acne. In this case, yes, it can be problematic. Hi Alana! Can you tell me please, which method is the best, electrolysis or thermolysis? I am confused.. Yes, it can be confusing, because there are 3 methods of Electrolysis, and each professional chooses the method they feel more comfortable performing. I believe the reason many professionals choose Thermolysis is simply because that is what the schools focus on. Very little Galvanic or Blend is taught in schools, and that is unfortunate. ​In my professional opinion, the Galvanic method is the most effective and safest method of Electrolysis. Galvanic is the original method documented by Dr. Charles Michel, in 1875 when he treated a patient’s ingrown eyelash. Galvanic electrolysis is simply a combination of salty tissue in our body, combined with electric current that is converted into Lye once the probe hits the moisture in the follicle. There is NO heat, or foreign substance introduced, and the regrowth is minimal. Yes, you can absolutely get rid of your pesky chin and upper lip hairs with Electrolysis. The cost, varies from practitioner to area, and the skill of the practitioner. Just be mindful that cost is a matter of expertise, professionalism and location. I've received electrolysis treatment for my upper lips/chin and legs (with very few hair). On the upper lips and chin I am experiencing acne breakouts one after the other and on my legs there are red dots exactly equal with the number of hairs which have been removed.I wonder if they are temporary or if you have any solution to expedite the recovery please? I forgot to mention that the treatment was 5 days ago. Thank you so much for your help in advance! Red dots are normal, that is just a healing process when Electrolysis is administered. However, acne breakouts are not common to healing. Do you have active acne breakouts before treatment? If you are receiving Electrolysis treatments while you have an active case of acne, the practitioner could be spreading your acne to other parts of your face. If you are only experiencing acne post treatment, you may have to investigate Galvanic if you are receiving thermolysis. My daughter is 24 and she has hormone challenges. Her facial hair is starting to really bother her.she lives DC.and time is very limited, what I wanted to know how many hairs can be done in one session and is hormone imbalances a problem? She had Laser done and it never worked and she broke out terribly does that happen with electrolysis also? Hormonal imbalances can absolutely be treated, but only in conjunction with medical treatment. In other words, we can remove the hair that is already there, but unless your daughter’s hormones are regulated medically, she will grow new hair. Refer to my article published about hormones, there are specific hormones which must be regulated in order to stop new hair growth. Is it safe for me to get extensive galvanic electrolysis done on my face since I also have melasma? Will the electrolysis treatments cause inflammation that will then trigger the melasma to spread and/or darken?